The Harp Inn is a lovely old Welsh longhouse inn perched on a hilltop overlooking the beautiful Radnor Valley, close to the Powys/Herefordshire border. Independently owned and run by Chris and Angela Ireland, The Harp is a real pub, with ancient slate floors, oak beams, antique settles and a huge open log fire. When we took it over in 2010 our ambition was simply to turn it into the sort of place we would want to visit for good food, good beer, comfortable rooms and friendly service. Our cosy bar now offers cask-conditioned real ales, local cider and perry, and a wide range of good wines and soft drinks. The menu comprises home-cooked and mainly locally-sourced food and offers simple pub classics like home-cooked ham with free-range eggs and proper chips alongside imaginative modern dishes created by our chef. Our five comfortable guest bedrooms all have lovely views and modern heating and plumbing. We had no idea when we decided to move here just how much the area has to offer. It is a great base for a huge range of outdoor activities from fishing to rally driving, but there are plenty of less strenuous things to do as well, such as visiting our historic local churches, including St Stephens which is a few steps from our front door, museums or wonderful gardens. Our Explore page provides more information about the local area and all it has to offer. Whatever your interest in our area we look forward to welcoming you to the Harp and to helping you enjoy your time in this border country we have grown to love. Well behaved dogs are welcome in the bar (but we do keep some of the eating areas dog-free) and rooms. 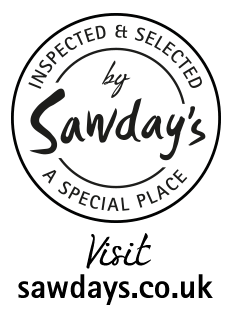 We are delighted to be included in current editions of the Good Pub Guide, Michelin Red Guide and Sawday’s Special Places (Pubs and Inns) and to have a current TripAdvisor Certificate of Excellence based on the online reviews we have received this year. In recent years we have been featured in the Sunday Telegraph’s selection of “Britain’s 50 Cosiest Pubs, shortlisted for the BBC Countryfile Magazine’s Rural Pub of the Year award and been selected as one of the top 30 food pubs in Wales. Dinner is served Wednesday to Saturday evenings from 6pm to 9pm.